Our deepest fear is a powerful emotion that comes to visit us when we least expect it. It's an emotion that's not going to disappear any time soon yet you still forget about it until you step out of your comfort zone. This can be for anything in your business or personal life but when it rises only some use it to move past it quickly. I know from personal experience I have used fear as the excuse for why I could not move forward on a project or situation. Fear is very clever if you come to think about it. You are ready to do something then fear raises its ugly head, then all of a sudden we have a list of reasons why you can't. Oh yes, fear makes us become excuse experts all of a sudden. We could talk for days, weeks on why we can't do something all because fear said we can't. This is even worse when you are sitting at home in front of your computer screen and knowing that to sell your products people need to see them. The biggest step is putting your images either on your own shop or uses an online marketplace. Once there you know what needs to happen, you need to get traffic flowing to your products. However are you ready for others to see what you created when you have been used to just your friends and family seeing them?. You can cry out " I need traffic," but are you saying that and acting upon it or are you merely crying wolf. Fear can stop you in your tracks and make you doubt what big steps you have already made. You could have your product images displayed on a marketplace and become used to that environment So much so that you forget that there's another world outside this marketplace community. Fear will tell you to stay put, for its comfortable and you are used to that. Those in your community understand what its like to sell and grow your business so why to look elsewhere. The marketplace is bringing in customers so why venture outside this protected circle. Fear will keep you saying and thinking of good excuses to why you can't venture outside. Excuses to why you should depend on the promotion of the marketplace website. Excuses for why saying I need traffic is enough. Fear makes you truly believe these excuses are real. It's the same if you have a website, people need to know you are there, that takes work. 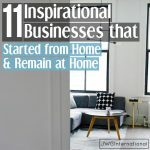 continued work but fear can make you keep that business website to yourself. You have a beautiful gift, that you need to share with the world. No one else can share your gift, only you. It's your purpose to share with the world what you have created, so they can have it in their world too. When fear comes to hold you back you need to think of those who deserve to see your work and move forward, no matter how hard it may seem. It's hard putting yourself and your creations out there. It's time for you to look within yourself and see those excuses for what they really are. Fears way of holding you back. Fears way of making you comfortable with what you have & not what you can attain & achieve. "I acknowledge your fear but I will not make you stop me"
When you feel fear, you are progressing forward, out of your comfort zone. It's the new and the unknown that is getting your heart pumping. Use that adrenalin to step on fear and expose yourself to the new. When fear rising up for me I read the following poem. I heard this poem as a speech by Nelson Mandela and it was so powerful. Then I heard it in the following films The Spelling Bee and Coach Carter. Every time I hear it or read it, it seems to become more powerful and enables me to squash fear. I have a printed copy of this poem on my wall in my bedroom by my mirror The mirror I look into every morning alongside another statement, which I will share via email [you will need to be on my brilliant people list to get it :)]. Read this powerful poem about what fear should make you think, act and do. In the end, I have created a printable version for you to download, print and pin somewhere in your home where you will always see it. 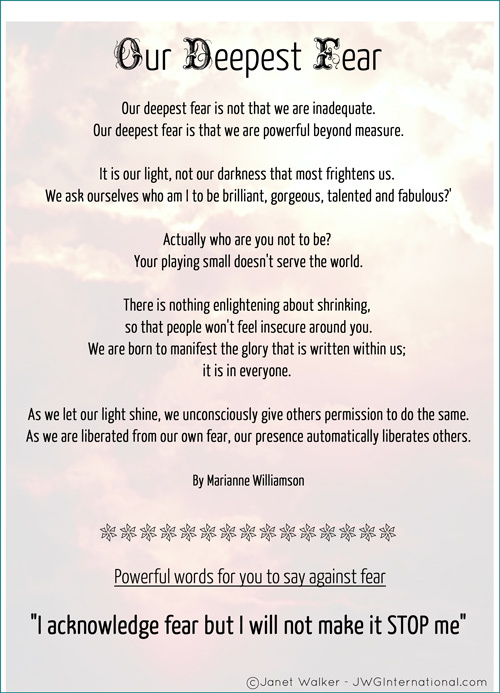 You will never get bored of this powerful poem make it be your morning read and use its power to make you squash fear when it comes to stopping you in your tracks. There is nothing enlightening about shrinking, so that people won't feel insecure around you. We are born to manifest the glory that is written within us; it is in everyone. As we let our light shine, we unconsciously give others permission to do the same. To download this poem & pin it to your wall, simply click the image below. Thank you for a much needed message today! 1. Fear stopped me in my tracks when I got my hand slapped for posting messages on two websites as I tried to communicate FREE download dates for my book. Moderators called the messages “shameless self-promotion.” I was horrified and humiliated and considered bowing out of those particular communities. 2. I overcame the fear by writing back directly to those moderators. I apologized for crossing any lines, re-emphasized that I earn no royalties on FREE downloads (which I also stated in the orginal posts), and thanked the moderators for giving me a second chance. 3. What I learned: First, be careful about clauses. Read them. Second, take chances anyway. Don’t act in fear, act in hope and confidence! Third, know that if your goals and motivations are pure, God will handle the details. 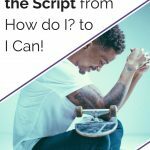 From those SAME posts that got me in trouble, women reached out to me and THANKED me profusely for offering them encouragement through a free download of my book. Thanks Janet for being there for other creative minds. We don’t always follow the rules, but we must act more in faith than fear!!! Well you stepped on fears face head on – you go girl. You did good. Even though you were horrified you still dealt with the situation head on and got some great results because of it. No, Thank you for reading my words and taking action when needed. Gosh, who can’t not relate to fear stopping us from moving forward. Okay, I guess there are those few unique individuals who go for it anyway despite what they feel. I wasn’t one of them unfortunately. Not sure when the last time fear stopped me in my tracks but I know after coming online I didn’t progress like I should have because of fear. Fear of the unknown, fear that people wouldn’t care about what I had to say, fear that they wouldn’t believe me, fear that I couldn’t do it, you name it. It was back at the end of 2010 that I took a course and I so badly wanted to move forward, past all the fear. I had a very serious talk with myself and I decided that I was going to do every single thing they taught me to do whether I wanted to or not. I moved through the fear and did it anyway and do you know how freeing that was? Look at me now! Had I remained stuck I wouldn’t be where I am today. Oh and guess what else. It didn’t hurt at all and I surprised myself by a lot of the answers I was telling myself in my head. They were not true so I say more through it anyway and you’ll be glad you did. It’s not easy but who wants to remain stuck! Thanks for this oh so important topic today! We’ve all been there I’m afraid. Thanks for stopping by. Yes fear can do so much harm if we let it in. Its not a easy thing to tackle but if we do stand up against it, fear does start to shrink. You talk about a course you wanted to do but fear was telling you other wise but you overcame and did the course anyway. I truly believe things happen for a reason and that course was meant to find you at that time. You needed the course to show you that you are stronger than fear. I am now on my way to check out your new post. Thanks for this wonderful reminder to not let fear stop us! Stacey-Ann recently posted…New Watercolour Painting Technique – Using Salt! Your so welcome. Fear can be such a beast that it can stop us in our tracks. Control the mind and fear is nothing more than a reminder that yes we can step out of out comfort zone and grow. Your zazzle store looking very refreshing and natural.